Each mature tree is our gift, purchased and given to your family by our family as a lasting remembrance of your loved one. This is our funeral home’s way of saying thank you for your faith in us. It costs you nothing, but can give you such peace. You are encouraged to choose your tree during the prearrangement discussion. 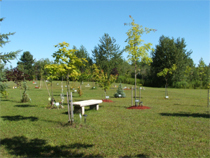 Trees may be planted at the funeral home or the location of your choosing. There is no need to drive to some distant location! 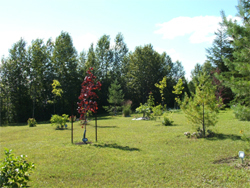 Make the planting and dedication of your special tree part of the funeral or memorial service. We are pleased to offer this special gift to each family. 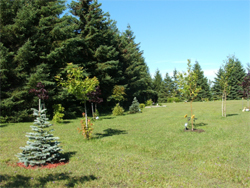 The funeral home property allows us to plant your special tree here where it can be tended and is accessible to you 12 months of the year. We encourage our families to make the area around their tree special; adding gardens, benches, solar lights, bird baths and feeders, statuary, etc.